Traveling will teach her a lot about the world, its inhabitants and different cultures. This is knowledge she can’t pick up at school and we are positive it will help her later on in her life. What an experience for our 6-year-old! Avoiding some destinations. You simply can’t go everywhere. We personally don’t take Febe to countries with malaria or dengue, but it all depends on one’s child(ren)’s health and age, of course. I must also admit that since we have Febe, we are much more reluctant to go to politically unstable or potentially dangerous locations (e.g. Istanbul, Tunisia…). On the other hand, we did go to Cape Town last year, but we never ventured far away from the (touristic centre of the) Waterfront. Adding some fun activities for the kids. For example, choosing an all-in hotel as your local home is nothing to be ashamed of: we did it when we traveled to Marrakesh and it turned out to be a great idea. We were away all day exploring the city and the Atlas Mountains, but when we came back to the hotel, Febe had a huge swimming pool to plunge into and an impressive buffet to choose from. It worked out perfectly for the three of us. An extended luggage list. You’ll need a lot more medicines and health products, not to mention big loads of diapers, a stroller or even a travel bed. This might put some limitations on holiday plane travel, although it’s far from insurmountable. Last year, Annick contacted like-minded travel families to answer a few questions about traveling with children. Some of them are even full-time travelers, which I think must be a real challenge but it certainly is something I have a great deal of respect for… You can find their testimonies here. 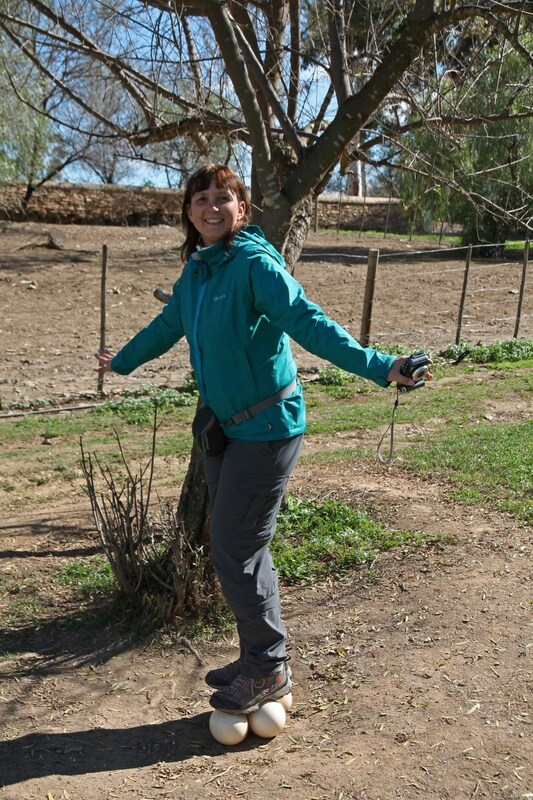 When we went to South Africa in August of last year, we added Oudtshoorn as a stop especially for Febe. 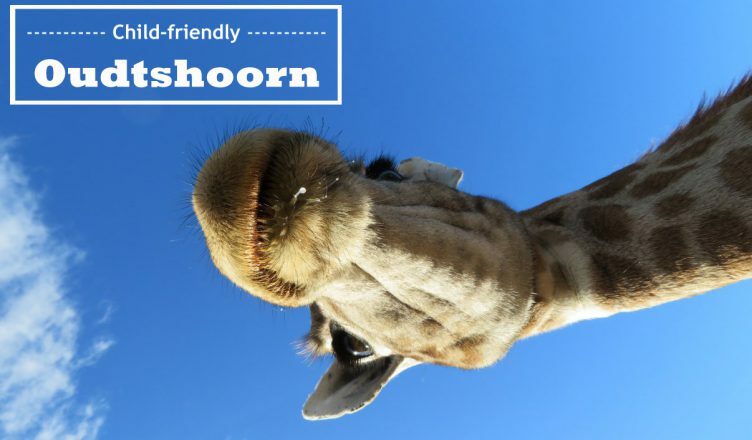 Oudtshoorn is the tourist capital of the Little Karoo, a semi-desert natural region. 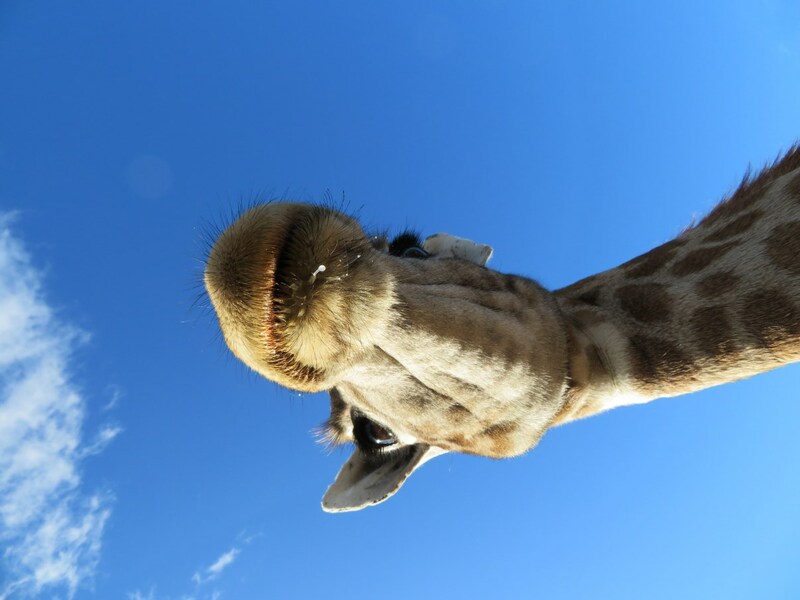 It also claims to be the ostrich capital of the world. Ostriches have been bred here since the 1870s and the sale of ostrich feathers has brought a lot of wealth to the city. 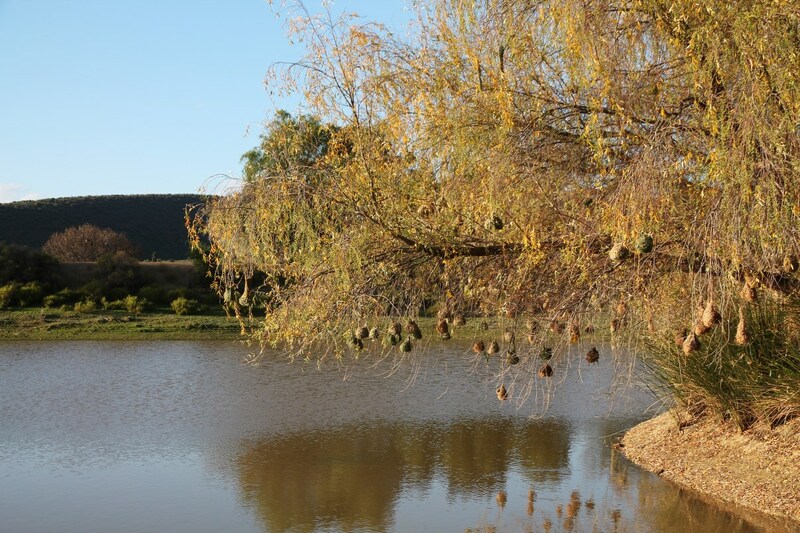 Today, there are still many ostrich farms in Oudtshoorn which are worth visiting. 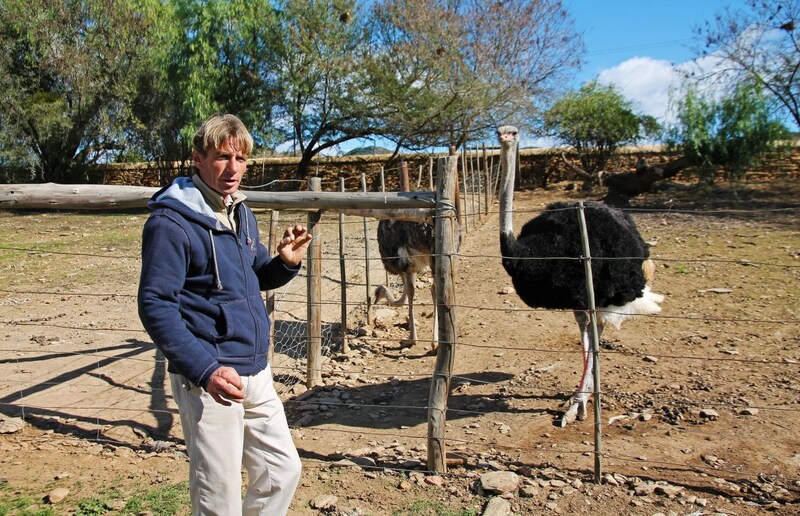 In Oudtshoorn, you can learn everything you ever wanted to know about ostrich farming. Oudtshoorn is located on Route 62, promoted as the longest wine route in the world. It was approximately 3.5 hours driving from our previous destination, De Hoop NR. 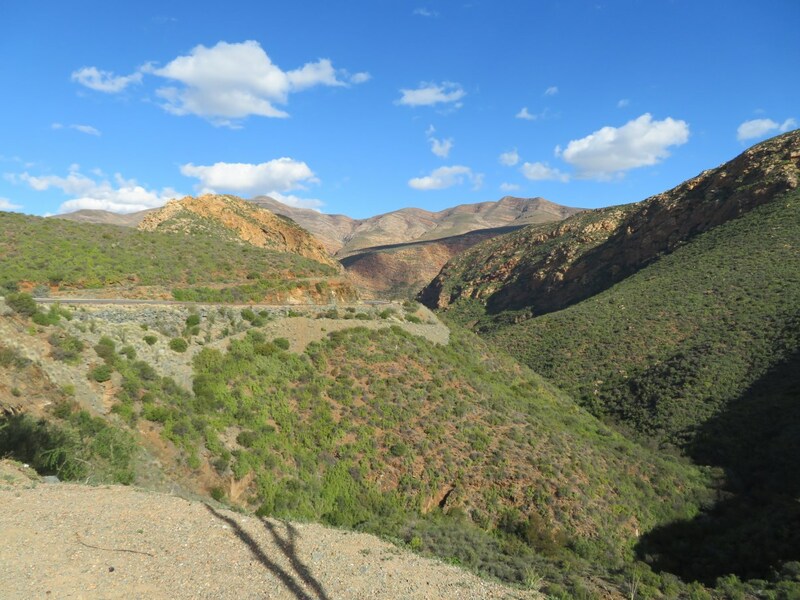 In order to get to Route 62, we had to cross the Tradoupass, a relatively easy, 16km road through the Langeberg mountains (max. elevation only 219m). The scenery here was magnificent! 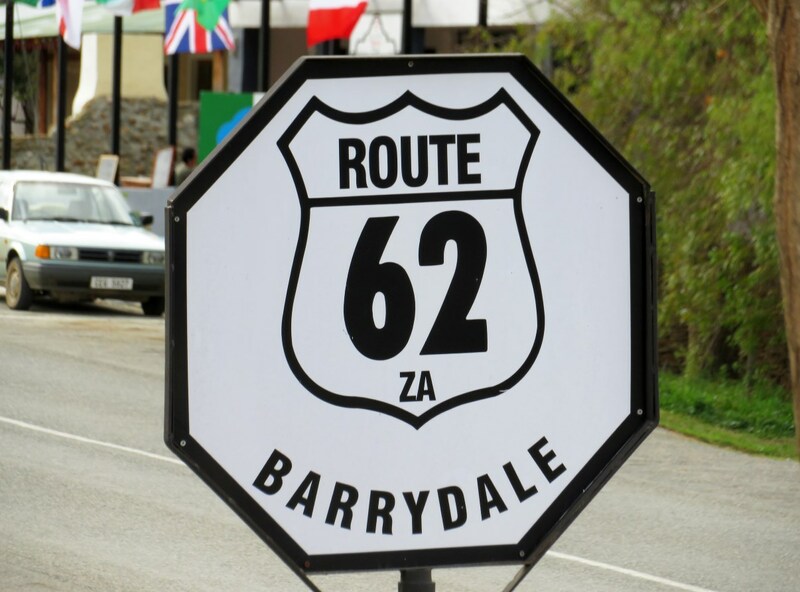 We had lunch in Barrydale (in the Country Pumpkin Restaurant, the self-declared most famous stop on Route 62…) and it felt like we were on a road trip in the States. 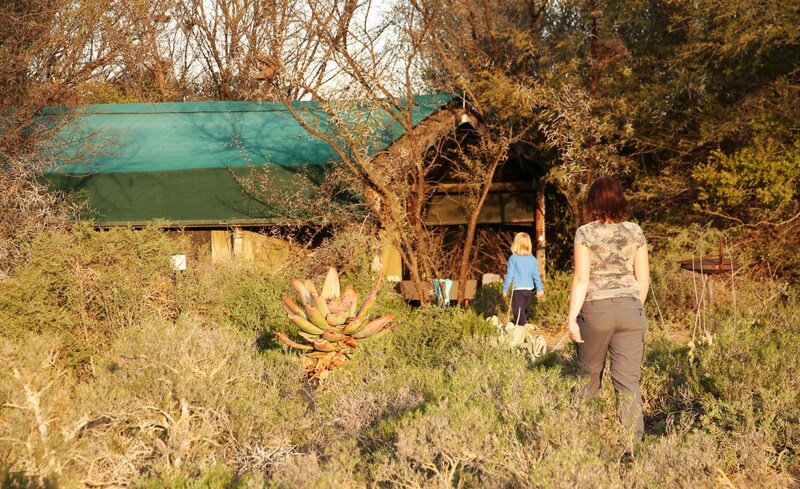 We stayed at Chandelier Game Lodge & Ostrich Show Farm in Oudtshoorn. 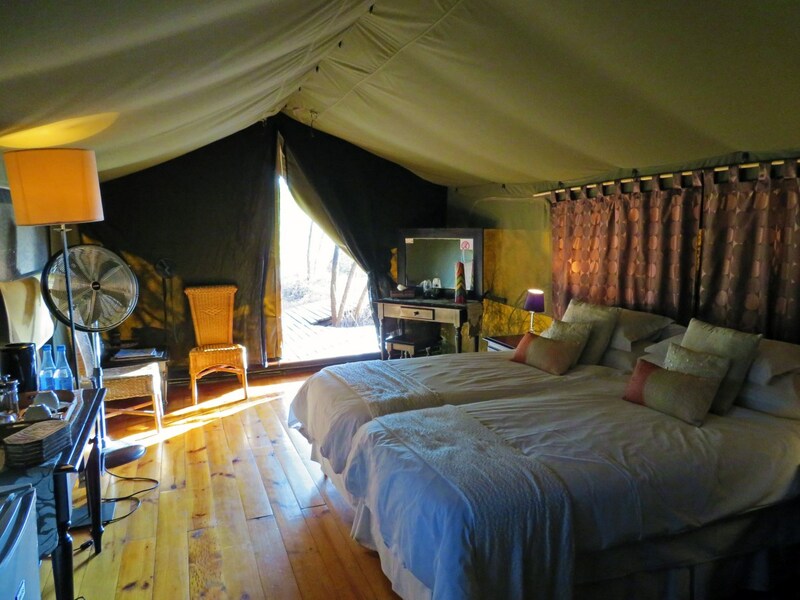 On arrival, we were given an upgrade of our accommodation: since there were almost no visitors to the farm, we could sleep in a superb, luxurious tented chalet instead of the log cabin we had rented. Our elegantly decorated tent had three comfortable beds (with heated blankets again, which was needed because temperatures dropped to 4°C at night), a bath, an outdoor shower (a very effective but rather cold way to wake up) and a great view over the vast stretch of Little Karoo in front of us. 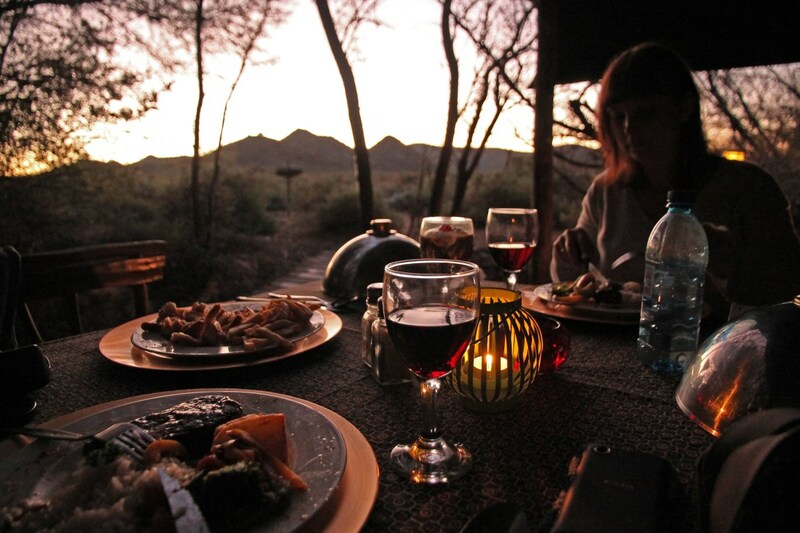 That first evening, we ordered three meals that were brought to our tent and enjoyed a perfect family evening! Quite a luxurious tent it was. 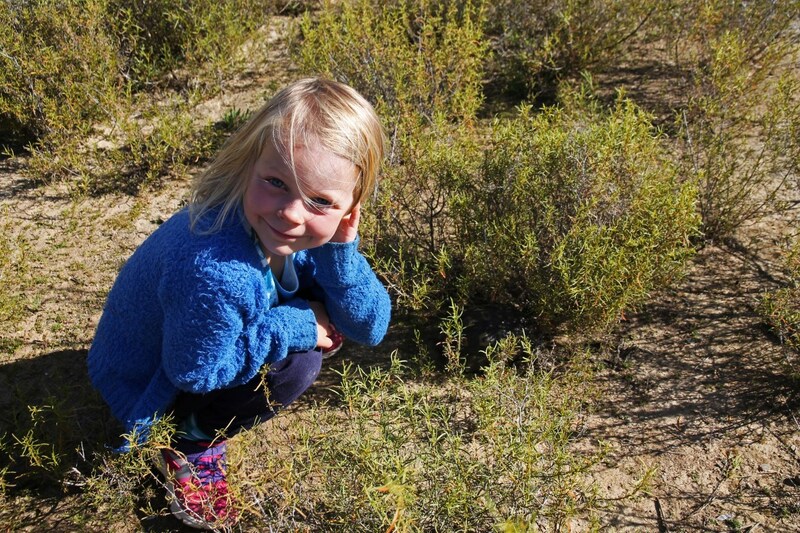 Little Karoo, in front of our tent. 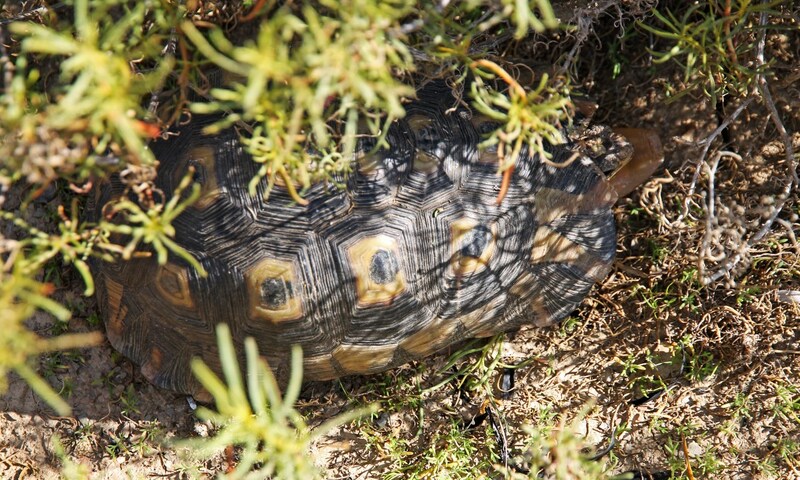 The immediate surroundings of our tent were teeming with life. The birds in the trees above us were very busy all the time and their twittering functioned as our natural alarm clock at sunrise. 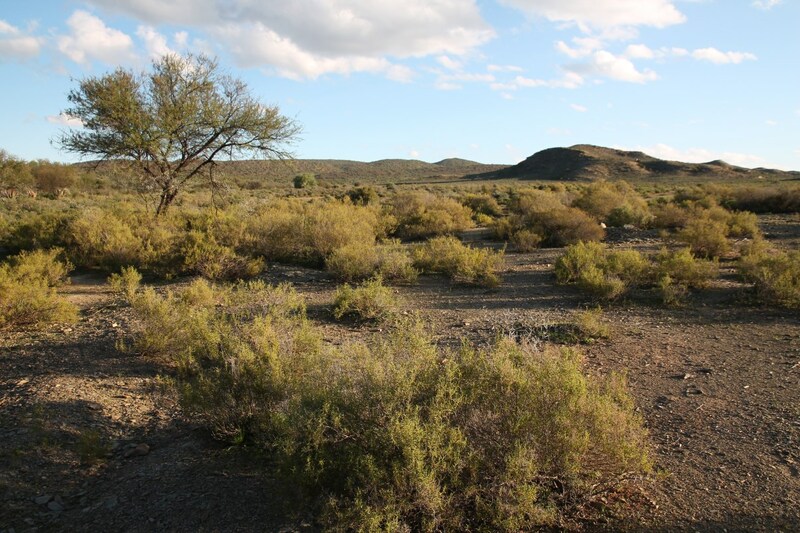 At first, the scrubby Little Karoo vegetation in front of our tent seemed very inhospitable, but we did spot Springbok and turtles there. Febe and “her” turtle. Can you spot it? A short walk away from out tent, a small pond with a tree in the middle of it hosted a considerable weaver bird colony. 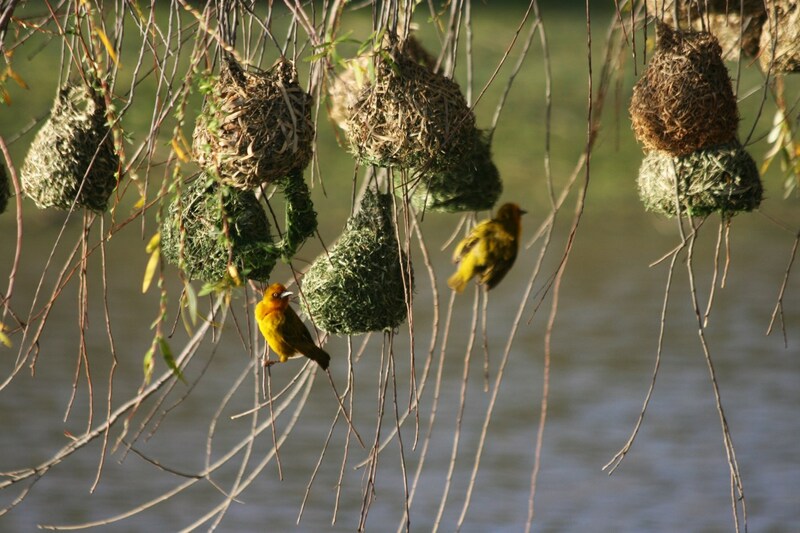 Weaver bird tree in the pond. Walking back to the tent. Our stay at Chandelier Game Lodge came with an included early morning game drive. Although I always tend to question the authenticity of such private areas with re-introduced species, I do consider this to be a good thing for the species’ distribution and survival. It may not be “natural” in the strict sense of the word, but at Chandelier, the animals do have an area of approx. 3500 ha to roam freely. Although weather conditions were not optimal that day, we did see wildebeast, impala, nyala and springbok. 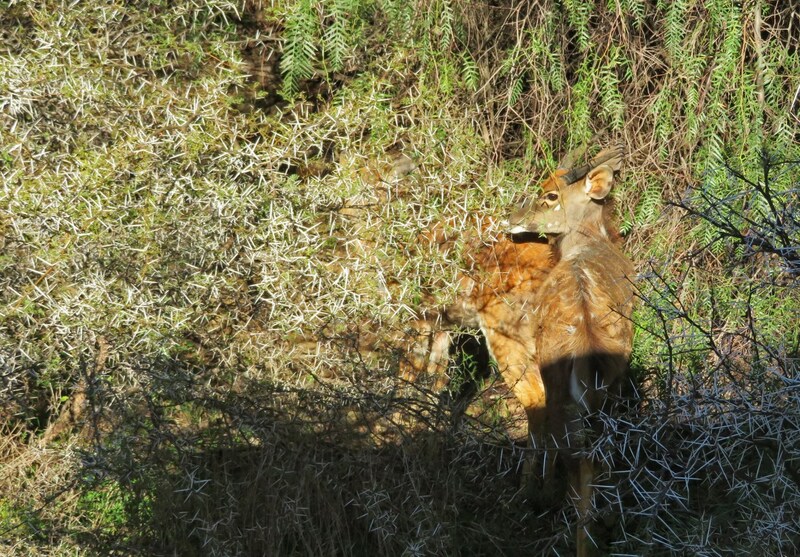 A few shy female nyala. After this mini-safari we arranged for a tour of the ostrich farm with Chandelier’s excellent guide Mark. Febe doesn’t understand a lot of English yet, so Mark explained everything in Afrikaans, a language similar enough to our native Dutch. We were lucky to get a private tour of the farm (it was clearly low season here) and Mark made sure Febe loved the whole experience, using a lot of humor, interesting facts and fascinating stories about these impressive birds. Even though the ostriches are principally his source of income, I felt a kind of friendship and understanding between him and the birds. 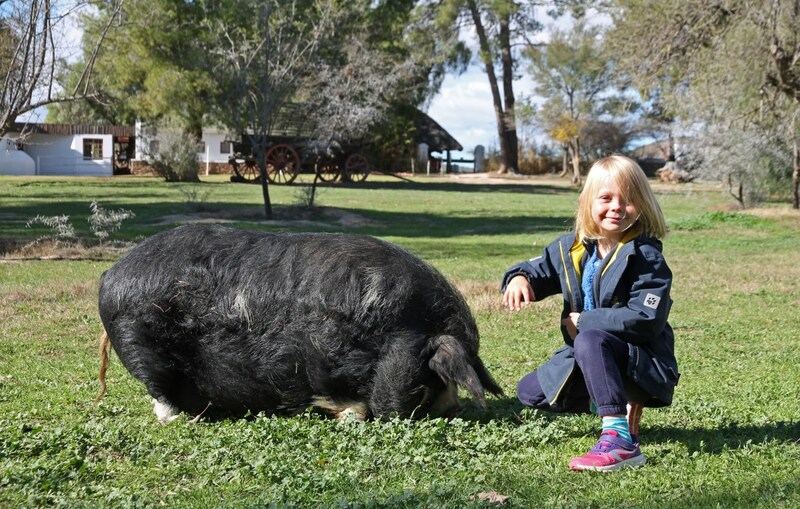 Febe and Chandelier’s huge pig. Febe empirically learnt that even an adult can stand on a few ostrich eggs without breaking them. 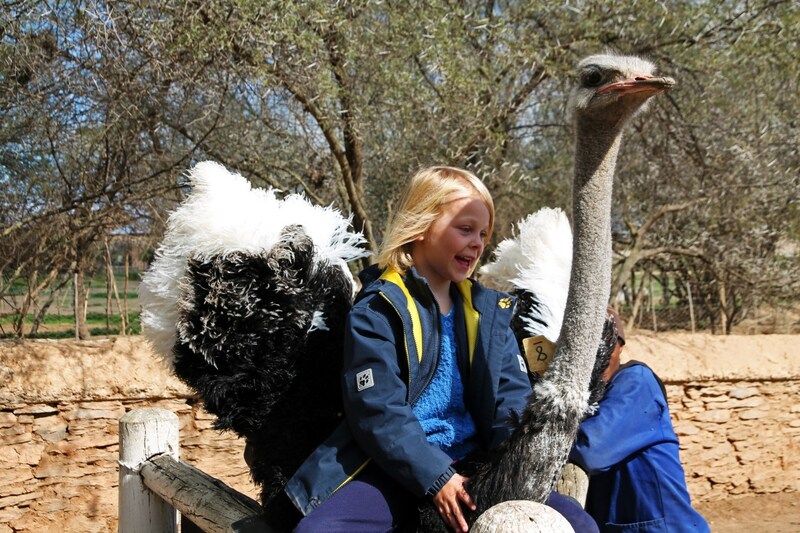 At the end of the tour, she was allowed to ride one of the ostriches, which she obviously loved! 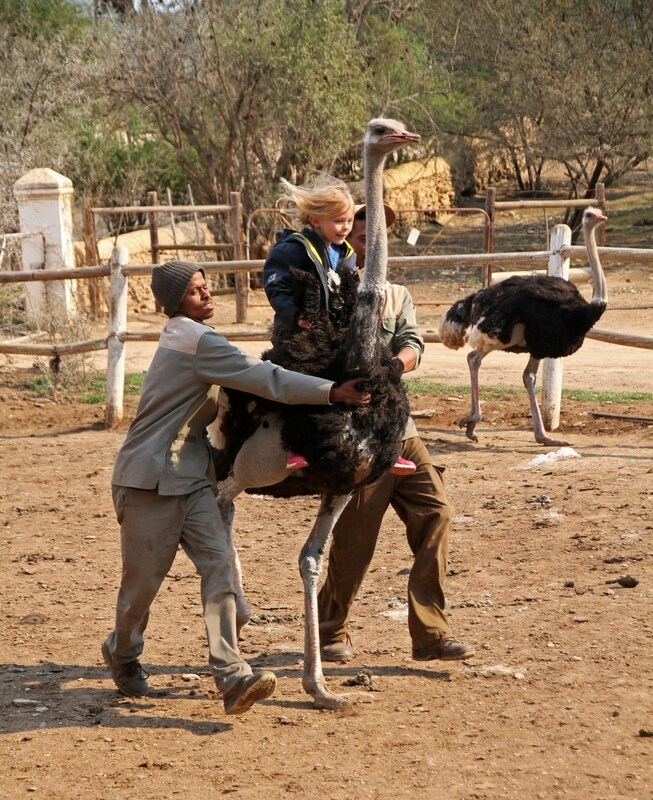 Riding an ostrich, a once-in-a-lifetime sport. 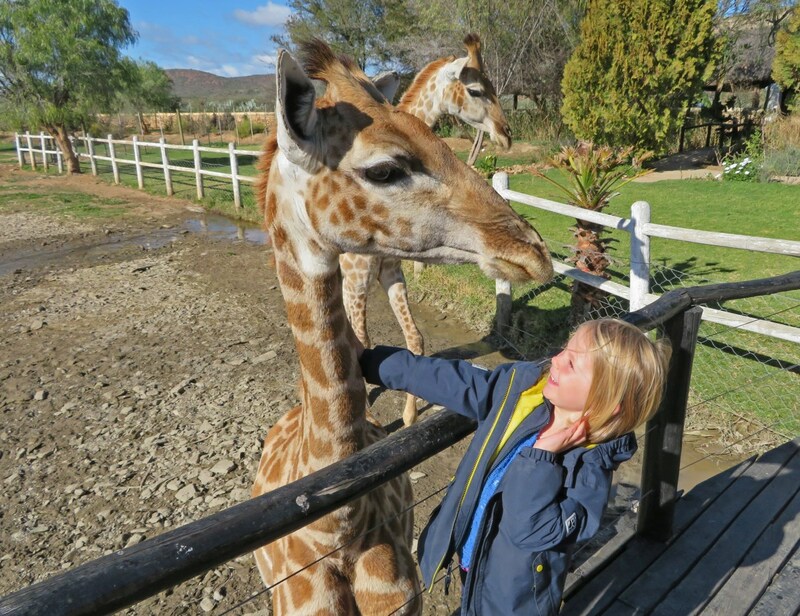 Although riding an ostrich was definitely a once-in-a-lifetime experience, the real highlight of Chandelier Game Lodge are the two orphan Giraffes Shorty and Sheila. They are very tame and easily approached for petting. For a small fee it is also possible to feed them milk from a bottle, which is something Febe still talks about regularly, half a year later. 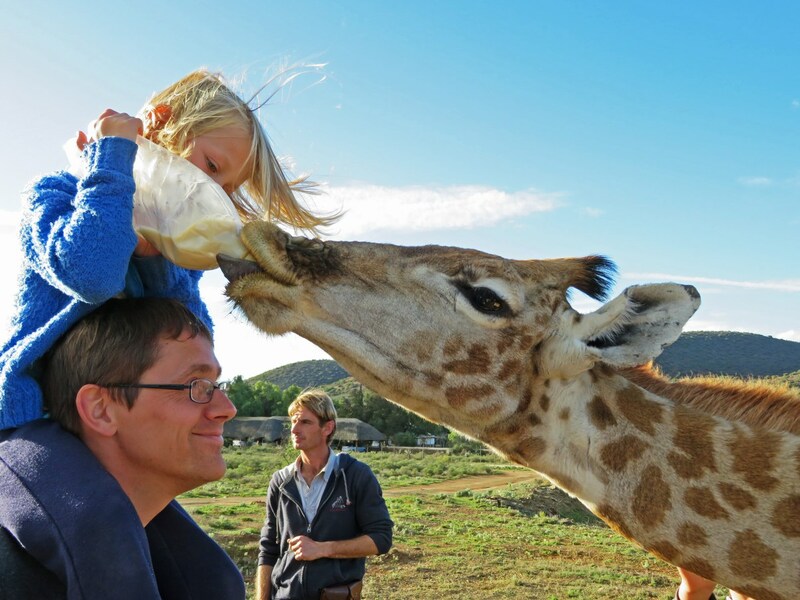 I have always been a supporter of untouched nature and love to see animals in their natural habitat, but here at Chandelier I felt a great deal of respect and love for each animal, so I am sure they do have a pleasant life here. In the end, this was one of Febe’s highlights of this trip, and I must admit one of ours as well!